My beloved wife and partner, Elyn Aviva, is an inveterate pilgrim, ever since she walked the Camino de Santiago for her PhD dissertation at Princeton University. It follows that we periodically walk one or another pilgrimage road in Europe. 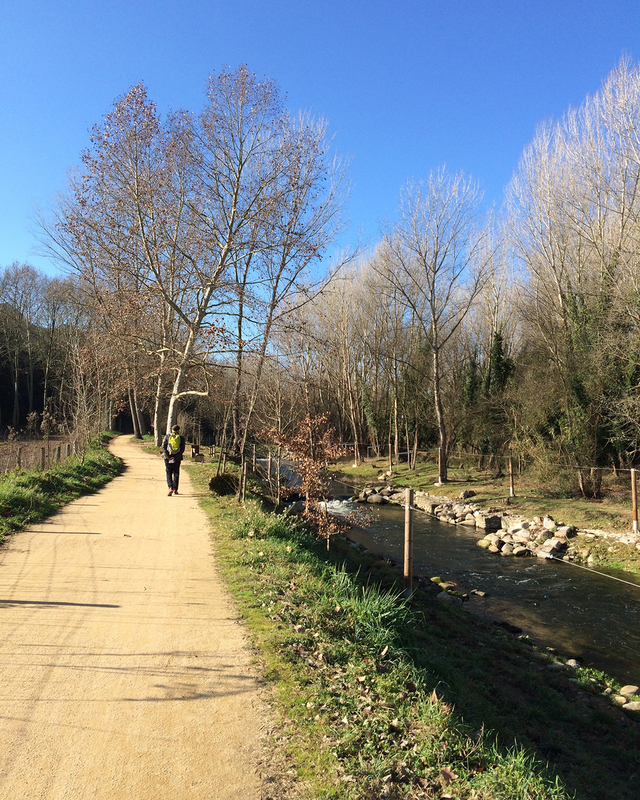 This time it is the Camí de Sant Jaume, which passes by our front door in Girona. We’ve done this part of the trail before, but we are enjoying making the journey again. Our method is very leisurely. We walk as far as we choose and take a local bus back home. The next day, or the next time we go out, we take the bus to where we left off and walk another stretch. It’s very civilized, and we sleep in our own bed each night! I know that purists will say this isn’t a real pilgrimage, but we say we are doing what we want to do with intention and a sense of destination, so buzz off. 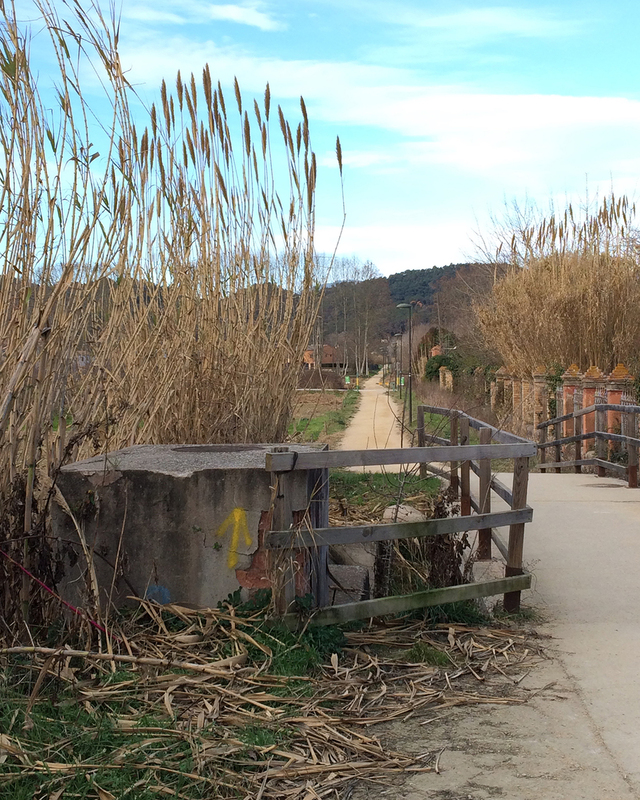 The first part of the trail we are walking is along the abandoned right-of-way of the former narrow-gauge railway between Girona and Olot. It goes alongside the Ter river for part of the way. This time, I have become aware of the way the river has been canalized and the water used for hydropower. These canals are not new. They date back to the middle of the 19th century and were used as a power source for textile factories, which were abundant in Catalonia. When I’m walking, I have a lot of time to think. So I began to wonder about the history of the region. I also mused about how this tiny area, Catalonia, which contains only 6% of the land mass of Spain but generates nearly 25% of the GNP of the country, is being snubbed by the central government in Madrid. One might think that the region that is keeping Spain from joining Greece down the financial rabbit hole would be given considerate attention by the Powers That Be, but apparently not. My intuition was that the canals I was walking past might shed some light on the situation. 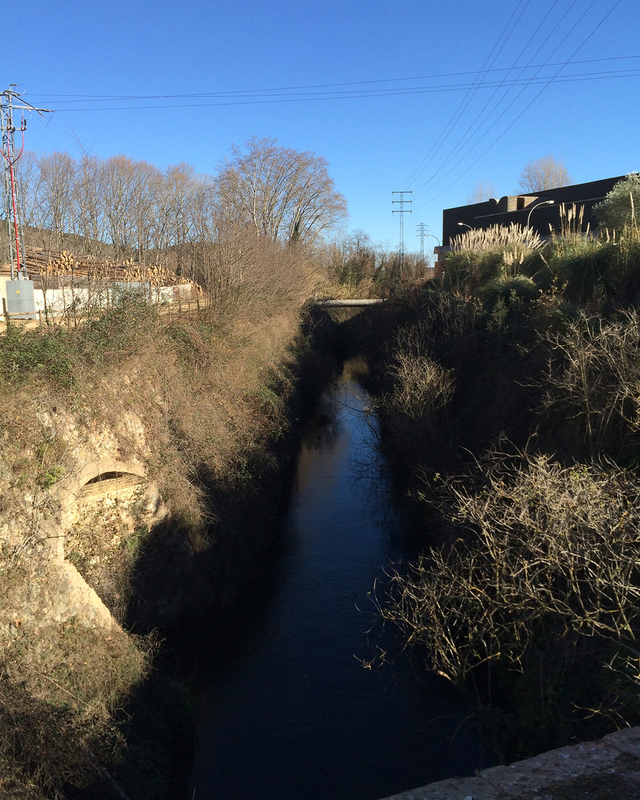 I came home and did a little research and then visited one of the lovingly restored textile plants in Anglès. Here is what I have learned. The Catalan textile industry goes back a long way—to the 12th and 13th centuries. When the Industrial Revolution came along in the 18th and 19th centuries, Catalonia was in a position to capitalize on the technological developments. 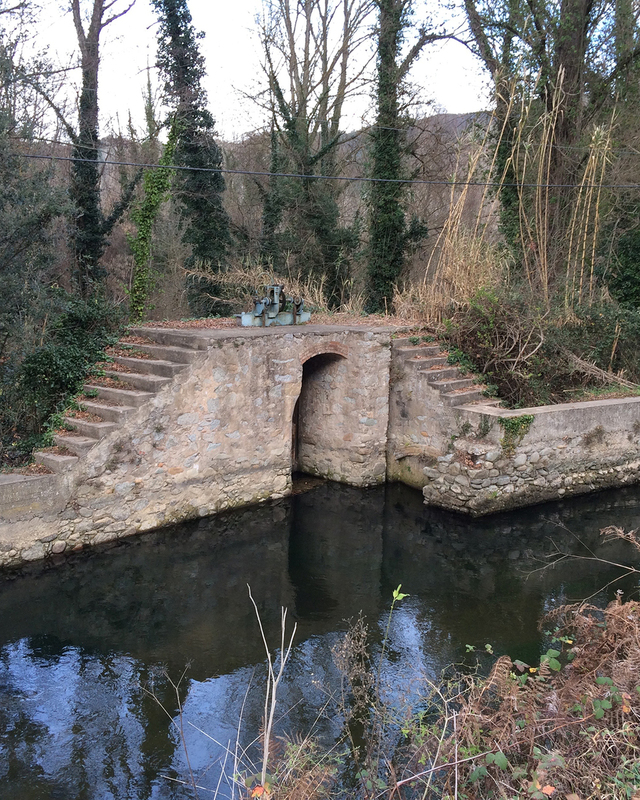 There was an abundance of hydropower in the rivers that flow down from the Pyrenees Mountains, and the Catalans quickly brought those resources to the textile industry by canalizing the rivers and capturing the power that resulted. The canals we were walking past were created in the mid-19th century and textile factories were built along the canals. Indeed, the abandoned railway line which is now a green way had been created to deliver raw materials and transport manufactured goods to the coast from these factories. In the 20th century, as textile manufacturing moved away from Europe, some of the factories were converted to electric generating plants. 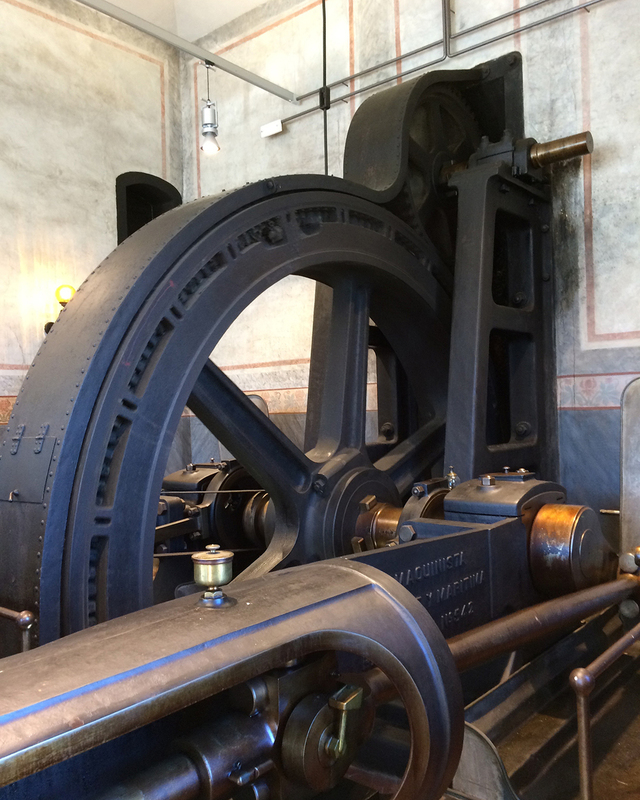 Many of these early hydroelectric plants are still pumping electricity into the grid. We have one of these plants in Girona, in a building only a block away from our apartment. 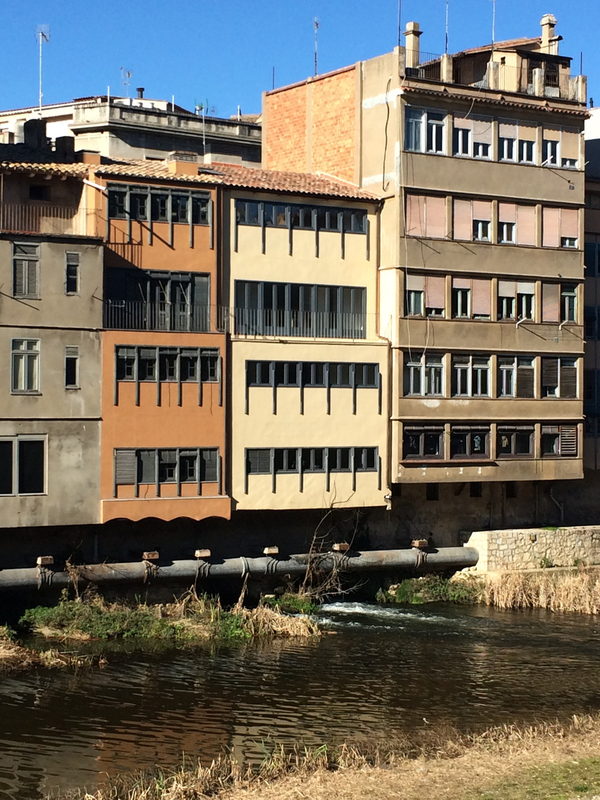 Most people have no idea that the dingy building with cracked windows on Carrer Santa Clara is a generating plant, but it is—and it is still in operation. It uses water that has been drawn off the Onyar River upstream to quietly generate electric power and then dump the water back into the river. In the 19th century, while much of the rest of Spain was a feudal society, raising sheep and farming, Catalonia was becoming an industrial power. During the Industrial Revolution Catalonia became part of the modern, industrialized Europe that emerged. Much of the rest of Spain remained feudal. I think that I detect remnants of that feudal way of thinking in the present Spanish central government. It appears to me that Spaniards tend to think of Catalonia as one their possessions, to be treated as a colony, and of the Catalans not as fellow citizens in a democracy but as subjects. In other words, Spaniards have a feudal frame of mind. The loss of Catalonia would amount to the loss of one of their possessions. Spaniards appear to think that there is something unsavory about the economic power of Catalonia. They say, “Catalans only think about money,” and they are jealous of the success of the region. They say that the economic success of Catalonia is due to the market for Catalan goods that Spain provides. They refuse to talk about issues such as equitable distribution of tax revenues and protection of the Catalan language because they think they own Catalonia. If Catalonia causes trouble, Spain can just “send in the troops to restore order.” Judging by the news, that seems to make perfect sense to many Spaniards. "Cutting off the nose to spite the face" by Triton Rocker (talk) - I (Triton Rocker (talk)) created this work entirely by myself.. Licensed under CC BY 3.0 via Wikipedia. An English-language saying comes to mind. We say that someone is “cutting off his nose to spite his face.” I’m wondering if that is what Spain may be doing right now. Stay tuned for further developments. Interesting times here in Girona!